Dimensions Length: 2629 mm / 103.5 in. Front Wheel 3.0 x 18 in. 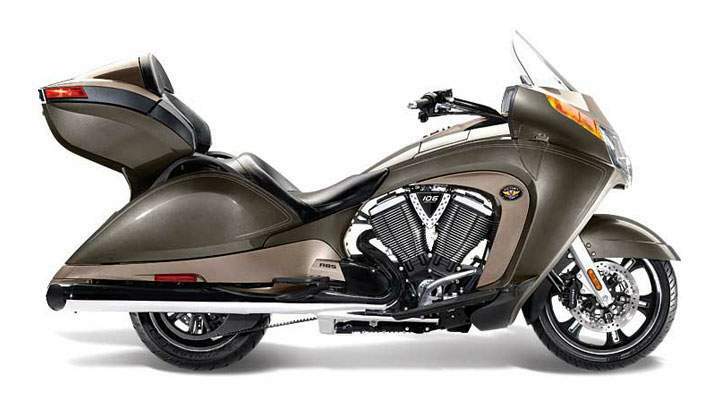 The Vision goes way beyond the concept of a cruiser fitted with a windscreen, saddlebags and comfortable seats. It introduces the fairing wrapped around a V-Twin engine, something that has never been seen before at a production motorcycle. This gives it its daring and imposing appearance, but the flowing lines are testimony of the levels of refinement found on this think. The streamlined V-Twin powered cruiser was created to put an end to the wind protection problem that kept appearing at these kinds of motorcycles and the adjustable windshield has much to do with that. Everybody can now find its perfect riding position and with the simple push of a button direct the wind on the very top end of their helmets and still look great and ride in complete comfort. 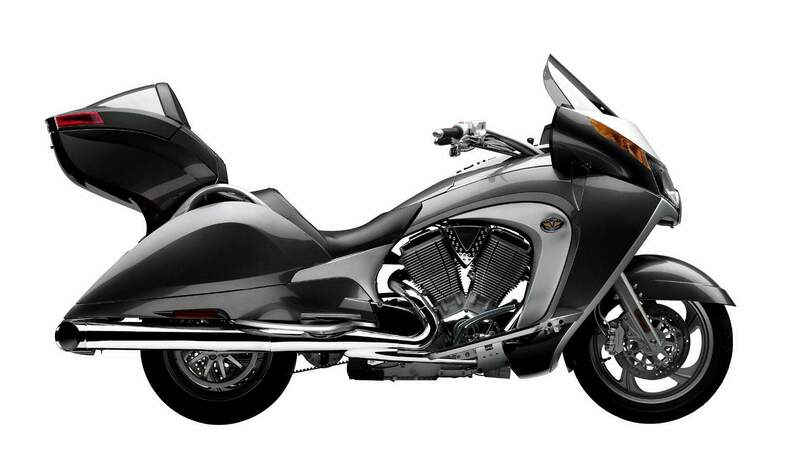 With low-positioned, perfectly integrated saddlebags and trunk on the Tour version, the Vision looks like following a descendent characteristic design line which creates the choleric design. Even though Victory offers this many models for 2009 (six, anniversary model included), the story is basically the same on each one, with only a few differences. The simple Vision misses the passenger backrest and trunk as they are present on the Tour version. 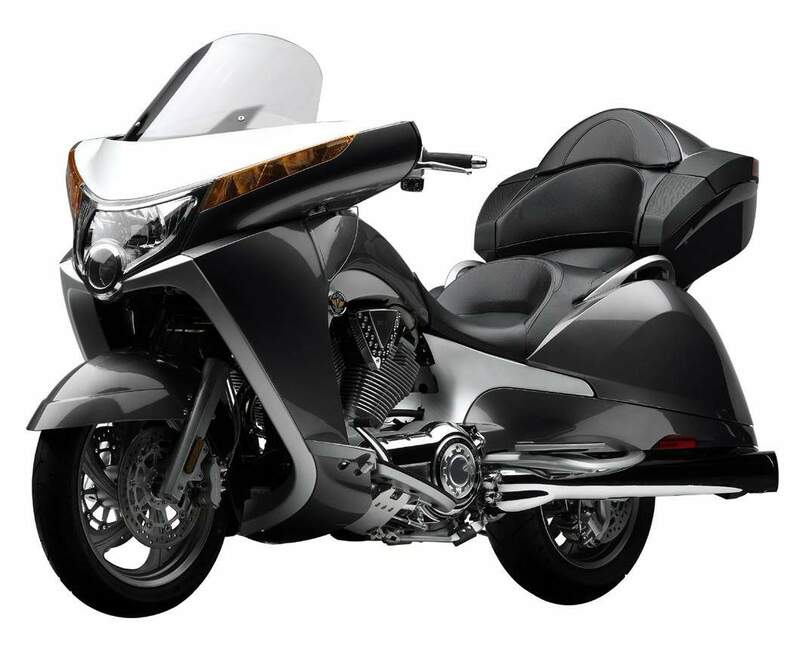 What comes special for 2009 is the 10th Anniversary model which features the custom stitched seats, backrest and trunk lid, saddlebags anniversary decals, and the exclusive 10th Anniversary badging. The limited edition model also stands out thanks to the exclusive fiery Red color scheme that it features with the purpose of further enhancing the already impressive design features. Probably the most highly-refined American Touring bike ever made, a machine well ahead of its time and an inspiration source for others, the Victory Vision stands as the completed goal of entire teams of engineers and designers that have worked together in order for their mark to become a consecrated brand.